Broadway Fashion is a Toronto staple, and has been in the fashion business for more than 20 years. What started off as a women’s formal attire store quickly turned into an urban retailer at the forefront of Toronto’s fashion industry. Broadway now carries niche premium brands in outerwear, footwear and apparel for both men and women. 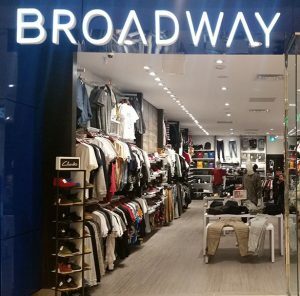 With two locations in the GTA, Broadway continues to dominate the Toronto fashion industry. Now with its online store, Broadway is making a name for itself across Canada and around the world. Always ahead of the latest fashion trends, Broadway brings its clients the best of what the urban fashion (or fast fashion) industry has to offer, every single season. With unparalleled customer service and a personalized shopping experience both in-store and online, we guarantee that our customers will have exclusive access to our unique vision at exceptional price points. We keep the guesswork out of what to wear each season by curating the latest styles and carrying the best brands. Trends change, but fashion is what Broadway does — after all, we’re here to make you look good.